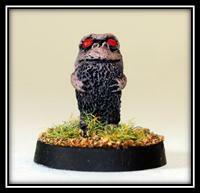 15mm.co.uk has discovered a new alien species, has made models of them, and is now selling them to you! The Krators have arrived ! Krators are vicious predators who hunt in packs and are quite capable of eating through the toughest walls and armour with their row upon row of needle sharp teeth. Perfect for many settings and game systems including USE ME.